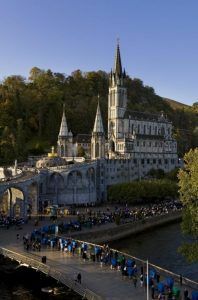 The Sanctuary of Lourdes is a cosmopolitan place, an universal sanctuary which strength comes from the diversity of its people. It is considered the first pilgrimage Marian destination in the world. Every year, more than 6 million people arrive to this place looking for relief and hope. The origin of this devotion comes from the experience of one person and a chain of events that happened to her: Bernadette Soubirous and the apparitions. Bernadette Soubirous was born in January 7th 1844 in the Boly Mill, one of the many mills present in the area. 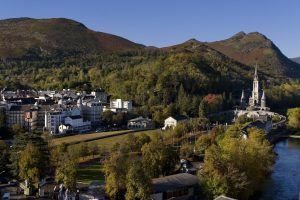 Lourdes was a small village of 4,000 inhabitants. During 10 years, she and her family lived and worked there. A chain of unfortunate events hit the family: the father lost an eye in a working accident, later on he was accused of stealing several sacks of flour and he went to prison, an important drough ruined the weat harvest and the mill went out of business. In addition to this, a cholera epidemic devastated Lourdes. Bernadette got sick too and she would suffer the consequences of the cholera and tuberculosis for the rest of her life. Bernadette´s family, submerged in poverty, must leave the mill and move to the building of an old prison (“le chalot”, jail). On February 11th 1858, Bernadette and two other girls went to the forest to pick up some firewood. Suddenly, she saw a light with the shape of a young woman in the grotto she was at. This was the first of the 18 apparitions she witnessed. As a result of these events, the first pilgrims arrived and a chapel was built in the place. This chapel would later become the sanctuary as we know it today. Later, differents churches and building were added, making the set of the sanctuary that we can see today. 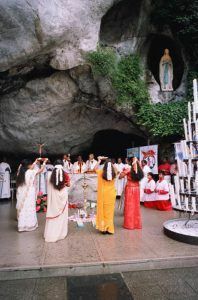 The Massabielle Grotto is the place where the apparitions took place between February and July 1858. The grotto consist on three different cavities. The biggest one is where mass is celebrated. The image of Virgin Mary is located on the right side, a six feet high cave. This is the actual location where she appeared to Bernadette. The fountain found by the young woman following the instructions of the Virgin can be seen on the left side of the altar. The Image was sculpted following the indications of Bernadette. The image represents the Apparition when she said: “I am the Immaculate Conception”. Wen the pilgrims go out of the cave, they touch the rock and make the sign of the Cross. 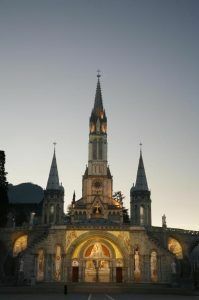 This is one of the acts characteristic of the pilgrimage in Lourdes, an expression of faith. The Inmaculate Conception Basilica is located on top of the Grotto. On the right side of the entrance, there is an engraving in a marble plaque made by Monsignor Laurence that declares the authenticity of the apparitions. This basilica and the Grotto are the original sanctuary. Our Lady of the Rosary Basilica: with a capacity for 1,500 people, the name comes from the 15 mosaics that represent scenes of the mysteries in the rosary. It was declared artistic monument and together they have the shape of a crown of roses, what it is a rosary. It continuously experiences damages due to the water leaks. The Crypt was the first chapel in the sanctuary. It was built to answer the Virgin´s requests to Bernedette during the 13th apparition. It is a place for personal and silent worship, the true origin of the sanctuary. The Saint Pius X Basilica is an underground basilica and it was constructed to celebrate the centennial of the apparitions. In addition to this, it also served to accommodate the needs of the countless pilgrimage groups that arrive every year. It has a capacity for 25,000 people, the bigest church in France. The Saint Bernardette Church is a modern building that was erected in the place where Bernedette saw the last apparition. On that day, the police closed the entrance to the Grotto and did not allow access to it. The Esplanade has a capacity for 40,000 people and gets all the splendor at night fall, when thousands of pilgrims take part in the Torchlight Marian Procession takes place. The Image of Our Lady of Lourdes has joined its hands in a sign of call to prayer and was sculpted following the indications of Bernadette. – dressed in white and with a blue belt. Initially, Bernadette did not like the image. 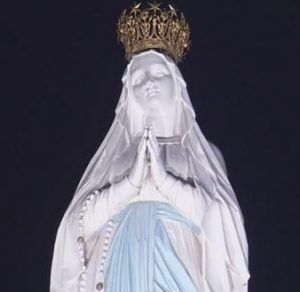 The image represents the Apparition when she said: “I am the Immaculate Conception” . It was placed in that niche on April 4th 1864. It was sculpted by artist Joseph Fabisch, professor of the Lyon Fine Arts School. The Water: The water that comes out of the springs in the sanctuary is not miraculous water, as it is drinkable water similar to any other water in the region. People drink this water and wash themselves under the hope and faith in the Virgin. Water in Lourdes is a sign, just as it is the water used for baptism. It is not a magic remedy. The Rock: The Grotto is the place where the apparitions took place. It is the exact place where the apparitions of the Immaculate Conception took place. Stopping by the Grotto and touch the rock is one of the actions performed by pilgrims as it is an expression of faith. The rock is a hard and strong element that means support and holding point. 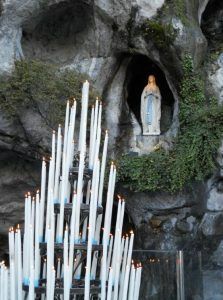 The light (& the candles): The light in Lourdes means faith and hope of illuminating and being illuminated. The lit candles before the Grotto represent the prayers of pilgrims. The Torchlight Marian Procession is the procession in which pilgrims carry a lit candle in their hands. It is one of the most important events in the. The Crowd: Lourdes is a cosmopolite place open to the world. It welcomes people of any raze, language or nation. Here the Church is experienced as a reunion of sons of God. The Sick: The mercy, care and attention paid to the people who are ill is one of the Lourdes ways of life. Every sick person that arrives comes under the protection of Virgin Mary. Saint Marie Bernard Soubirous (Bernadette) was born on January 7th 1844 in Lourdes. She was the oldest sister. Due to de poor eating habits and the living conditions, she had a bad health since she was a child. When she was 10, she caught cholera and asthma. When she was 14, she saw the apparition of the Virgin 18 times. On February 11th 1858, Bernadette and two other girls went to the forest to pick up some firewood. Suddenly, she saw a light with the shape of a young woman in the grotto she was at. The apparition and Bernadette did not say a word to each other, they only made the cross sign. That was the first apparition. In one of them, the image revealed her name, “The Immaculate Conception” and in a different occasion the apparition gave Bernadette a message. She wished to have a chapel constructed, so people could go to pray there. On July 16th, the last apparition took place, the farewell. Bernadette knew that it would be the last time she would see the Immaculate Conception. AS AN EXCEPTIONAL MEASURE THE BATHS WILL BE CLOSED FROM 30TH OCTOBER 2017 TO 23RD MARCH 2018. You need to consult the last information on Lourdes web.